How did Downers Grove get this unwarranted reputation as the epicenter for Sears homes? Around 1990, a volunteer for the historic society took the book Houses by Mail and attempted to identify the Sears houses in town. After five years, the volunteer came up with 150 Sears homes. Since that initial estimate of 150, the numbers have varied wildly from year to year. 286 kit homes, made by Sears and other manufacturers. Also claim was made that Downers Grove had the largest collection of Sears homes in the country. As of this writing, the Downers Grove Visitors Bureau nor the Downers Grove Historical Society provides a firm number of Sears homes on their respective websites. Obviously, there is some confusion with the research. I’m not sure how many different informal surveys were done or how many individuals were involved in the identifications. The good news is that Downers Grove is not quoting specific numbers on the internet anymore, nor are they claiming that Downers Grove has more Sears homes than any other place in the country. So what happened? Here are a couple critical problems with the research. Unknowledgable volunteers conducting the surveys. 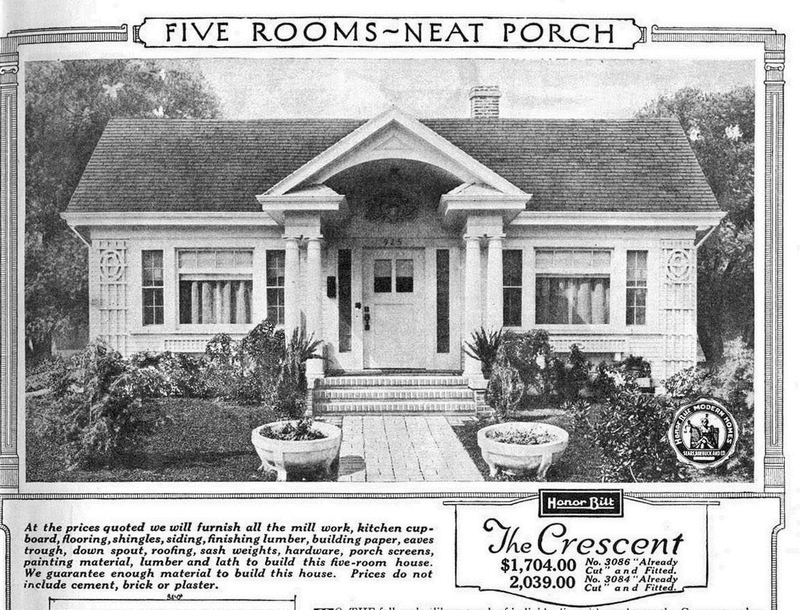 According to the early articles listed above, volunteers classified houses as Sears homes simply because they had “arched doors, multi-paned windows, sloping roofs, and phone hutches built into walls.” Unfortunately, most houses built in the 1920’s and 1930’s had those features—whether they were kit homes or not. This lack of understanding might account for the inaccurately high count of Sears houses in Downers Grove. 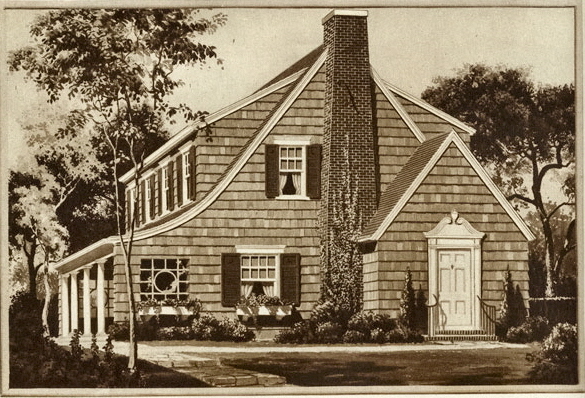 If a house didn’t match a catalog illustration, the volunteers proclaimed that it was a “hybrid” Sears model. According to the early articles listed above, “We found 25 in one day, plus a lot of hybrids-- combinations of several models." I can tell you that true hybrid Sears models are rare. Typically, houses identified as a hybrid of two Sears models are not Sears homes at all. In my opinion, it seems that the volunteers doing the initial surveys had a clear goal of identifying as many Sears houses as possible—accuracy be damned. 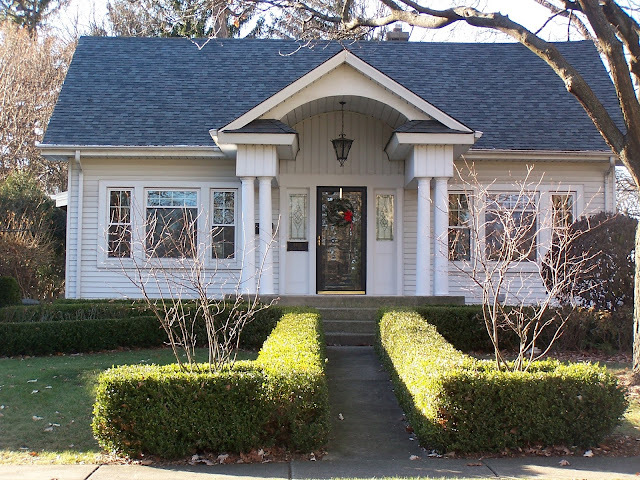 Here are some examples of the houses identified as Sears houses by the surveyors in Downers Grove. 4832 Bryan, Downers Grove. Incorrectly identified as a Sears Crescent. Many houses share a similar style. Photo from Realtor site. A real Sears Crescent at 4916 Seeley, Downers Grove. This was correctly identified. Photo courtesy of Sue Smith. 704 Chicago, Downers Grove. Incorrectly identified as a Sears Van Dorn. The Van Dorn was a small Dutch Colonial that did not have a center entrance. This is not a “hybrid” Sears model—it was never sold by Sears at all. I believe the original volunteer surveyors classified most Dutch Colonial Revival houses as Sears houses. Photo courtesy of village architectural survey. 601 Prairie, Downers Grove. Incorrectly identified as a Sears Cedars. This is a kit house from another manufacturer--the Hudson from Gordon-Van Tine. Gordon-Van Tine fulfilled the kit house orders for Montgomery Ward. 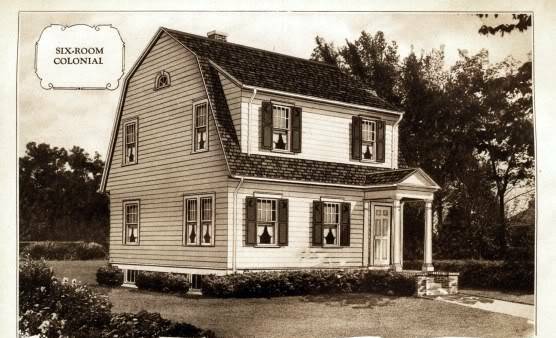 The very first kit house sold by Montgomery Ward was built in Downers Grove (demolished a few years ago). Census records show that many Montgomery Ward executives and managers lived in Downers Grove. With that in mind, what would a proper architectural survey turn up? Photo courtesy of village architectural survey. The Hudson from Gordon-Van Tine. 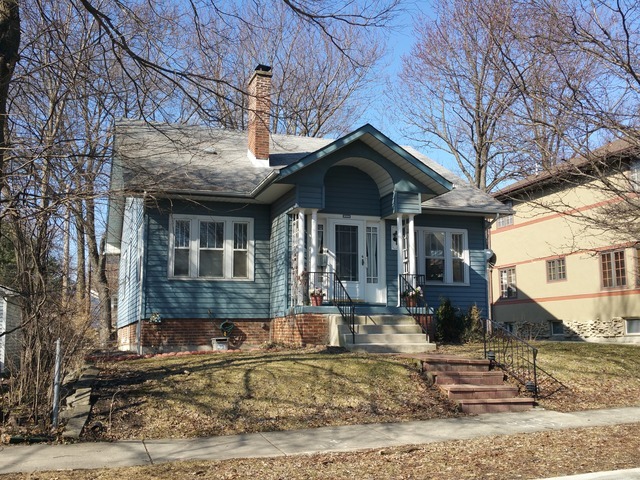 When reading the old news articles about Downers Grove and their purported Sears houses, there were a couple pieces of misinformation I saw mentioned repeatedly. Others have told me that these “facts” continue to be propagated today and mentioned on the Downers Grove trolley tours of Sears homes. Let’s address them. I almost choked on my Diet Coke when I read this one. Beginning around 1932, hundreds of customers who financed their homes with mortgages from Sears were unable to make payments. Sears foreclosed on 396 properties just in 1932 alone. No, the company did not decide to “eat the losses”. Rather, Sears hired a full-time employee whose sole responsibility was to resell or rent the foreclosed properties. The mortgage loans were also insured so the losses were mitigated somewhat. Sears Roebuck was a public company with shareholders to which they were accountable. Dupage County records clearly show that Sears Roebuck foreclosed on many houses in the 1930's. The statement about Sears eating the losses has not a grain of truth in it and I have no idea where someone could get that idea. This myth is continually restated on the trolley tour. First, Sears shipped houses by rail to virtually every suburb. Sears did not withhold shipments to certain train depots or rate certain depots as unsuitable to receive shipments. Regardless of the “excess tracks”, boxcars did not sit on the Downers Grove team tracks for 7-10 days while the homeowners leisurely moved the building materials to their home sites. Here’s how rail shipments worked. There was a fee called demurrage. It was the charge the railroad assessed a railroad customer for the time a boxcar was on the track for unloading. The clock started when the car was placed on the team track and stopped when the customer notified the railroad they were done unloading. All railroad stations in the Chicago area worked this way and Downers Grove was not unique. Additionally, I do not understand the logic behind the conclusion that people in Downers Grove would be more likely to order a kit home because Downers Grove had a roundhouse. The demurrage still applied and was an inconsequential amount compared to the cost of the house kit. Very well done, Lara. Great explanations of the TRUE facts. Honest research takes months or years, and I've encountered too many "local historians" who are just not willing to make that kind of investment into discerning and discovering those true facts. I also love the photos, showing "the boo-boos." Really demonstrates how sloppy they are with their comparisons. Great article, Lara. And excellent job of correcting the misinformation! Rosemary, the compliment means a lot coming from you, considering your attempts to make Hopewell, Virginia "see the light" about their alleged Sears homes. Thanks for your kind words. Laraine, thank you and there's a lot more correcting that needs to be done in DG as it pertains to their kit homes. According to the old articles, volunteers sent out letters to 200 homeowners at one point. I'd love to see those responses... I hope DG had the wherewithal to save all those initial lists and surveys. That would be a good starting point. Why can't I reply to a comment directly?! HIstorians in Downers Grove also has a habit of infringing on copywritten materials without creditting the source, although the authors are clever enough to change proper names like "Gordon-VanTine" "Aladdin" and other housing companies to support their historical fabrication. Julie, thanks for your comment. I'm a volunteer as well... no one pays me to maintain this website or get the photos. As a volunteer, I would never go to the media and claim vast numbers of Sears houses in my town (let alone more than anywhere in the country) unless I had someone with more experience take a second (and third) look at the houses. My opinion is that the original volunteer researchers were biased and that they wanted a certain outcome from the architectural survey and were willing to call almost anything a Sears house or a hybrid model in order to achieve that outcome. That is my **opinion** based on everything I've read. Downers Grove has many architecturally significant structures (Rinaldo house, Tivoli Theater, Avery Coonley etc. ), landmarked homes, and a rich heritage. It's a lovely historic community and it seems so silly that people were adamant that it also be known as the Sears home capital of the United States regardless of what the facts were. Lara clearly points out errors in the identifications done in Downers Grove and the historical account shared with visitors. Instead of acknowledging the obvious errors, it appears that some in Downers Grove wants to continue to distort the historical record. Why? If I saw several of the leading voices on kit homes in the US raising questions about the homes in my community, that would give me pause. But not in Downers Grove. We didn't sarcastically refer to it as "Uppers" Grove for nothing.